VERY GOOD IN FAIR JACKET. 372 pages. Softcover. Brand new book. ESPIONAGE. Mexico City was the Casablanca of the Cold War&emdash; a hotbed of spies, revolutionaries, and assassins. The CIA's station there was the front line of the United States' fight against international communism, as important for Latin America as Berlin was for Europe. And its undisputed spymaster was Winston Mackinley Scott. 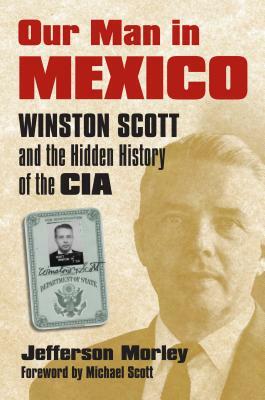 Chief of the Mexico City station from 1956 to 1969, Win Scott occupied a key position in the founding generation of the Central Intelligence Agency, but until now he has remained a shadowy figure. Investigative reporter Jefferson Morley traces Scott's remarkable career from his humble origins in rural Alabama to wartime G-man to OSS London operative (and close friend of the notorious Kim Philby), to right-hand man of CIA Director Allen Dulles, to his remarkable reign for more than a decade as virtual proconsul in Mexico. Morley also follows the quest of Win Scott's son Michael to confront the reality of his father's life as a spy. He reveals how Scott ran hundreds of covert espionage operations from his headquarters in the U.S. Embassy while keeping three Mexican presidents on the agency's payroll, participating in the Bay of Pigs fiasco, and, most intriguingly, overseeing the surveillance of Lee Harvey Oswald during his visit to the Mexican capital just weeks before the assassination of President Kennedy. Morley reveals the previously unknown scope of the agency's interest in Oswald in late 1963, identifying for the first time the code names of Scott's surveillance programs that monitored Oswald's movements. He shows that CIA headquarters cut Scott out of the loop of the agency's latest reporting on Oswald before Kennedy was killed. He documents why Scott came to reject a key finding of the Warren Report on the assassination and how his disillusionment with the agency came to worry his longtime friend James Jesus Angleton, legendary chief of CIA counterintelligence. Angleton not only covered up the agency's interest in Oswald but also, after Scott died, absconded with the only copies of his unpublished memoir. Interweaving Win Scott's personal and professional lives, Morley has crafted a real-life thriller of Cold War intrigue&emdash; a compelling saga of espionage that uncovers another chapter in the CIA's history. (Key Words: CIA, Espionage, Spying, Mexico, Cold War, Winston Scott, Lee Harvey Oswald, Mexico City, Allen Dulles, Kim Philby, Warren Report, James Jesus Angleton, Michael Scott, Jefferson Morley, Bay of Pigs, Kennedy Assassination).